While dining at a Holiday Inn buffet may not be the most swanky or culturally significant thing you could be doing in Thailand, it does the job of giving you a wide variety of Thai and Western foods to choose from, in a format that is very foreigner-friendly. The hotel staff is equipped to handle English (and a host of other languages), and the food is diverse and clearly labeled. Cafe G’s is probably the best value you’re going to get in Thailand in terms of value, and though it may not make for a great story, it will make for a good meal with as many courses as you can handle. Kuroda is a fairly common chain restaurant in Thailand, despite it serving almost exclusively Japanese food. You drop 495 baht and eat as much traditional Japanese food as you care to. Full disclaimer – there isn’t anything special about the presentation – it’s pretty straightforward and simple. Regardless, the food is solid and the service is quick. If you’re the type of person who could eat shrimp tempura all day, or drown in bowls of ramen, Kuroda is definitely worth checking out. 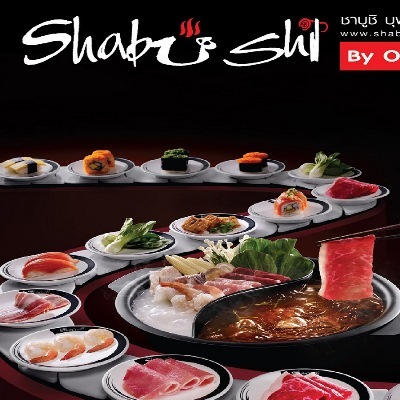 If you’re not familiar with the concept of shabu-shabu (also known as “hotpot”,) here’s the lowdown: you get a pot of boiling hot soup broth (which you can flavor yourself), and then you boil ingredients in it to cook them: meat, vegetables, mushrooms, seafood, you name it. It’s objectively great. Shabushi takes this concept and gives it the “sushi-go-round” treatment. Ingredients make the rounds on the conveyor belt, and for 350 baht, you can spend 90 minutes grabbing whatever you want to add to your broth. If you get tired of that, you can always back away from the conveyor belt and go for the sushi table or grab some ice cream for dessert.